Resurrection plants are a diverse group of angiosperms with a unique ability to tolerate near total desiccation – sometimes for years – appearing to be dead, and then to “spring back to life”, turning green and robust in a few hours. Unlike “most” plants, resurrection plants are primed to accept drying soil, altering their gene expression and protein and metabolite complements even to the point at which soil moisture is totally depleted.2 Within a few hours or days, they are as dry as the air and prepared to stay that way indefinitely, or to repeat the cycle a dozen times in a year. Clearly, from the standpoint of natural history, these plants are interesting as a phenomenon. Today, however, they are also recognized as potentially critical models because of their potential as resources for the manipulation of economically important species. The physiology, biochemistry, proteomic, metabolomic and transcriptomic level aspects of this have been very capably reviewed in recent years.1–3 This introduction to the group relies heavily on those reviews. 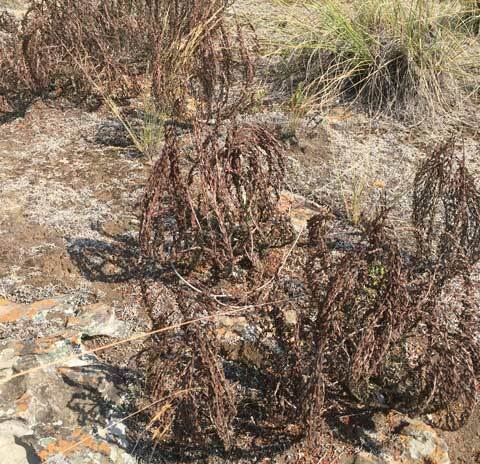 Based on 8000 years of agricultural experience, dry plants are dead plants; the exceptions are fascinating. A mere century ago, Dinter described the first ‘resurrection’ bush, Myrothamnus flabellifolia, demonstrating that it could go from green, to powdery dry, to green again in very short times (Dinter 1919, cited in 3). In recent years, the number of known resurrection plants has exploded, from just 10 fifty years ago, to ca. 300 now.4 Even at that, they constitute only about 0.1% of all angiosperms. Acknowledgements – This introduction was produced by John Cheeseman to whom comments, suggestions, and other words should be address. Of course, it was not accomplished with out help. Many thanks are due to Maria-Cecilia Costa (University of Cape Town), Mel Oliver (USDA/University of Missouri), Don Gaff (Monash University) and Dorothea Bartels (University of Bonn) for their input and assistance in developing this and the resurrection plants species pages. All seed plants, desiccation tolerant or not, have some degree of drought tolerance; they all have a leaf (and stem) cuticle that retards water loss, stomata to regulate evapotranspiration and allow CO2 entry, and xylem for long distance water transport between the soil and leaves. Together, these have led to an evolutionary movement toward drought tolerance through avoidance (homoiohydry). This can be a good technique. and it works in many – but not all – environments. The dune grass, Ammophila arenaria shows many examples of xeromphory. Click for higher magnification. More drought tolerant plants often also have xeromorphy (thickened, heavily cuticularized leaves), leaves that roll or curl when drying, stomata buried in grooves, very hairy, reflective leaves. Still, they can’t survive dehydration to less than 40% relative water content. This is still very far from being air-dry. Resurrection plants, in contrast, are truly desiccation tolerant. They occur where this is a prerequisite for existence, i.e. predominantly in shallow soils (e.g. 1 cm) on rocky slabs or shallow depressions in outcroppings in semitropical and tropical regions of Africa, America and Australia (although one, Lindernia brevidans, is native to east African montane rainforests).1 Most extreme are the chasmophytes; they grow in shallow cracks in rocks. 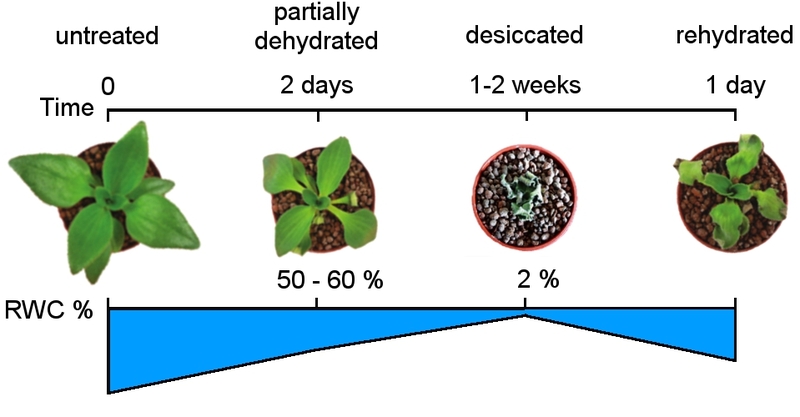 The ability of plants to tolerate dehydration requires that they be able to suspend growth and development, surviving in a dry state until water is available again. In fact, this is not a rare capacity; for seeds, it is common, representative of ca. 90% of modern angiosperms and gymnosperms, and it is equally widespread in pollen. Seed desiccation tolerance allows the formation of soil seed banks, and long range and long duration dispersal. In turn, this, along with the desiccation tolerance of pollen, potentiates expansion of a species’ range. Together with seed longevity (lifespan of seeds in dry storage), seed DT is the basis for ex situ conservation using seeds. This is an exceptionally important point: in fact, nearly all seed plants – angiosperms and gymnosperms alike – have the genetic information for desiccation tolerance! Other than in seeds, vegetative DT is represented in algae, lichens, mosses, liverworts, and ferns as well as in angiosperm resurrection plants. It has been proposed that DT arose initially with the transition from aquatic to terrestrial life forms. Then, both the probability of experiencing adverse conditions and the survival benefits associated with DT were high.3 However, as plants expanded in the terrestrial habitat and more complex ecosystems arose, a drawback of non-seed DT became evident: desiccation tolerance is expensive and DT plants grow slowly. Shifting and then shutting down metabolism during drying and fully recovering upon rehydration requires large amounts of energy. Instead, to avoid desiccation, most plants use the strategies of stress avoidance (completing their life cycles in times of low stress) or stress amelioration (development of structures such as deep root systems so that the lack of water apparent at the soil surface is not limiting). As a result, DT in vascular plants largely disappeared. Today, DT remains common in pteridophytes, but is rare in angiosperms and absent in gymnosperms. 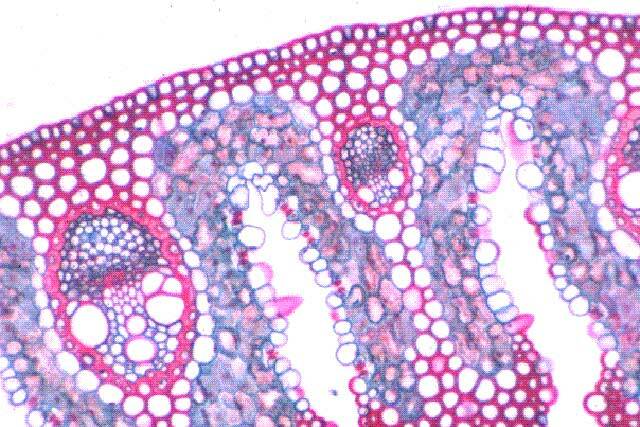 In total, it is estimated that only about 1,300 species of vascular plants are characterized by DT in any vegetative tissues, mostly in corms, rhizomes and tubers. The 300 exceptional angiosperms which are tolerant at the organismal level are, thus, not a taxonomically defined group going back to the time of the first colonization of land. Rather, extreme desiccation tolerance is found in 13 unrelated, mostly herbaceous lineages, implying it has evolved at least 13 times.3 In each case, DT has been regained by repurposing processes otherwise limited to seeds for foliage desiccation tolerance. A second approach has been to use suspected DT-related genes from resurrection plants in transformation of other model systems. The objective, here, is to transfer a desirable, but usually complex, trait to the target. Success with this approach has been mixed and is limited by the large number of possible single genes to test and by the very large number of networked genes to be coordinated. Finally, the elucidation of regulatory networks controlling DT and their key genes is a necessary and promising approach whether the goal is to understand DT at the molecular level, or to manipulate other species. Unfortunately, most resurrection plants are polyploid with large genomes and difficult or impossible to transform. With few, very recent, examples, their genomes have not yet been sequenced. One of the immediate conclusions from transcriptome studies (without genomes) is that different species have very different approaches, but all leading to DT. Craterostigma plantaganeum and Haberlea rhodopensis are good examples of this contrast.2The expression patterns of LEAs in Haberlea include a number that are constitutively expressed in fully hydrated plants, but are induced to higher levels during desiccation. This implies that under “control” conditions, this species is already primed for desiccation tolerance. Transcripts encoding LEAs in Craterostigma, on the other hand, are abundant only in dehydrated leaves. The massive expression of stress-protective transcripts during dehydration and rehydration implies the existence of finely tuned regulatory networks, that may have evolved by selection of promoter cis elements. These, too, are species, or at least genus, specific. Looking to the future, the most rapid progress in understanding DT will result from studies involving both a high quality genome and transcriptomes representing different stages of the desiccation and recovery process. Three recent papers have highlighted this potential. It is unfortunately not possible in this space to detail all the results and conclusions of those studies, but only to mention them briefly. If you have gotten this far, go read them. First, Xiao et al. 7 sequenced the 1.7Gb genome of Boea hygrometrica. Boea is homoiochlorophyllous, and the sequencing revealed expansion of Early Light Induced Proteins (ELIPs) and 5S rRNA genes important for protection of the photosynthetic machinery during drying and rehydration. Interestingly, the Boea genome showed no DT-specific genome organizational features, implying that the resurrection capability largely reflects alteration in the control of dehydration-associated genes otherwise associated with seed maturation and drying. The dispersal of dehydration DEGs throughout the genome suggests DT was not acquired recently, but rather, resulted from repurposing of the DT phenotype from seeds to vegetative tissues. The expansion of the rRNA gene complement was also notable, and the authors suggested it may be associated with increased DNA stability. The more than 1100 rRNAs is 25-50 times the number in the most closely related asterid genomes thus far sequenced (potato and tomato). With the genome in hand, Xiao et al. then followed the progress of dehydration and rehydration using analysis of GO classifications of the DEGs. GO classifications of the DEGs responding to dehydration and desiccation in Boea hygrometrica. Only GO terms with a gene number larger than 150 are shown. From Xiao et al. 7 Click to enlarge. It is particularly interesting to note that as desiccation was approached, mRNA surveillance genes appeared and accumulated, indicating emphasis on cleaning up damage in the transcript pool. At the same time, transcripts for pathways involved in photosynthesis and N metabolism were depleted even though the plants remained green. Overall, this study demonstrated a central core of genes involved in DT, including those for ABA metabolism and signaling, phospholipid signaling, LEAs, ROS scavengers and ELIPs. In the second paper, VanBuren et al.6pioneered application of single-molecule sequencing to the study of desiccation responses, generating a high-quality complete genome sequence (as well as chloroplast, mitochondrial genomes) for the homoiochlorophyllous grass, Oropetium thomaeum. This species, in addition to being a resurrection plant, is diploid, and has the smallest known grass genome. The single-molecule technique included both the gene space and intergenic regions (telomeres, centromeres, transposable elements and rRNA clusters), a major advance over other plant genomes. Such information will be essential for understanding the multi-dimensional gene interactions involved in many phenotypic responses, not just those involving desiccation. Finally, Costa et al.8 produced a high quality genome of Xerophyta viscosa and assessed changes in the transcriptome during dehydration. Although this species is octoploid, the chromosomes are small and the overall haploid genome size is only 295Mb. The fraction of the genes that are TRG (orphans) is also very low for a plant genome, as is the percentage of transposable elements. As we might now consider “expected”, transcriptional changes during dehydration reflected induction of genes associated with desiccation and maturation in seeds, and especially those controlled by ABA. This species is interesting in that young seedlings are desiccation sensitive, but tolerance can be induced by application of ABA. Unlike in Boea, however, dehydration responsive changes reflected transcript abundance in “clusters of desiccation-associated genes” (CoDAGs). With these, Costa et al. drew attention to LEA proteins, the ABI3 regulon, and the complex processes of autophagy. The locations of parologous genes in the CoDAGs was such that the authors concluded they were not simply different alleles for the same gene. 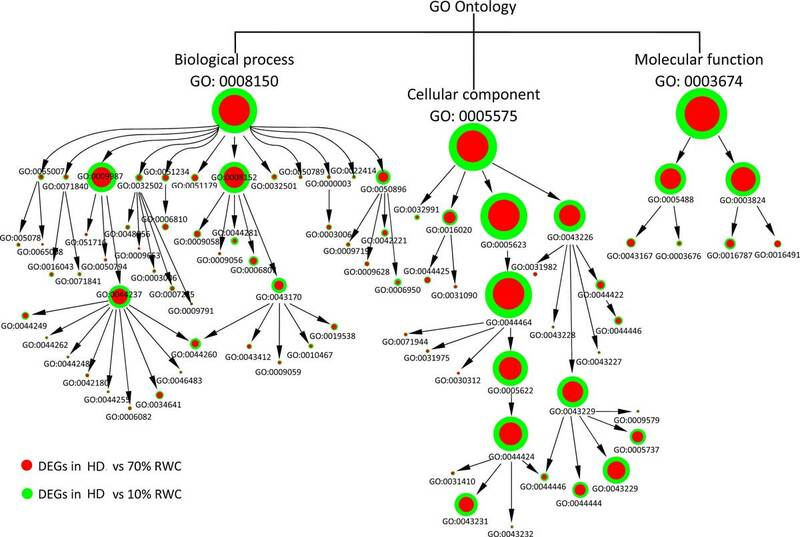 This study also took the approach of gene network analysis, identifying four “self-organizing maps” (SOMs) involved in metabolic redirection during drying and rehydration. Although ABA signaling is clearly involved, as in all other studies of DT, about 20% of the nodes in the SOMs were not differentially expressed in response to ABA application. Further analysis of these complex networks, both in X. viscosa and in other plants can be expected to point to central controlling (if not master controlling) genes. If manipulation of drought tolerance in crops is the goal, these may well be the keys to solving the problem. Porembski S, Barthlott W. Granitic and gneissic outcrops (inselbergs) as centers of diversity for desiccation-tolerant vascular plants. SpringerLink. 10.1023/A:1026565817218″ target=”_blank” rel=”noopener noreferrer”>https://link.springer.com/article/10.1023/A:1026565817218. Published 2000. Accessed April 29, 2017.